Four all-star interdisciplinary teams just unveiled their competing preliminary proposals for Washington, D.C.'s first elevated park--and it won't be a High Line copycat. 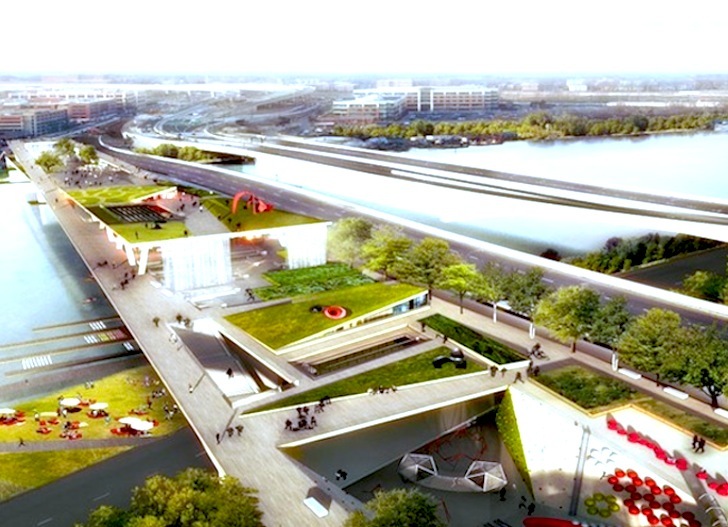 Developed as part of a six-month nationwide competition, the designs for the future 11th Street Bridge Park will transform an unused freeway bridge into a 900-foot-long mixed use space that will connect two economically and racially disparate city districts. The four teams, which consist of landscape architects, architects, and structural engineers, include some of the most prominent names in design including Balmori Associates, OMA, Stoss Landscape Urbanism, and NEXT Architects. Covering an area greater than three football fields, 11th Street Bridge Park will offer a variety of programming from environmental education and public art to urban agriculture and recreational sports. Unlike New York’s High Line which cuts through the upscale Chelsea neighborhood, Bridge Park will link the wealthy and predominately white Navy Yard district with economically disadvantaged Anacostia neighborhoods. 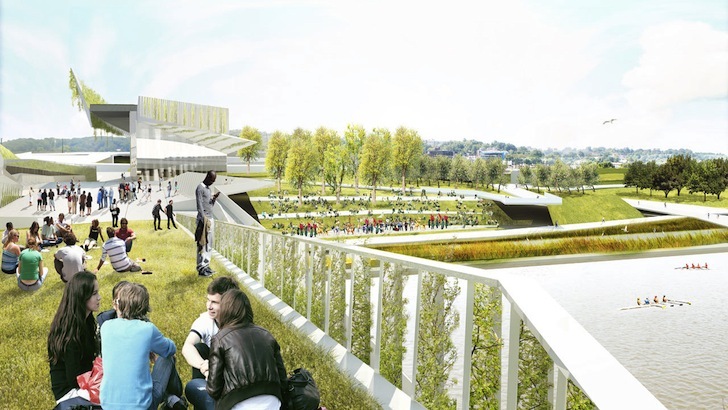 While structure and programming varies across designs, all four shortlisted teams have placed heavy emphasis on community needs and developed the park as a year-round destination, rather than a fair-weather tourist attraction. The four teams involved include: Balmori Associates / Cooper, Robertson & Partners; OLIN / OMA; Wallace Roberts & Todd / NEXT Architects / Magnusson Klemencic Associates; and Stoss Landscape Urbanism / Höweler + Yoon Architecture. The competition organizers have also invited the public to review and rank the renderings. Final designs will be shared in September and the jury will select the finalist in October. Design by Stoss Landscape Urbanism / Höweler + Yoon Architecture focuses on creating a place for social gathering rather than just transit. OLIN / OMA's park design will "offer layered programs, presenting a new neighborhood park, an after-hours destination for the nearby workforce, a retreat for residents and a territory for tourists to explore." The design by Wallace Roberts & Todd (WRT) / NEXT Architects / Magnusson Klemencic Associates hopes to reengage people with the riverfront. While structure and programming varies across designs, all four shortlisted teams have placed heavy emphasis on community needs and developed the park as a year-round destination, rather than a fair-weather tourist attraction. Balmori Associates / Cooper, Robertson & Partners' design is "more than a river crossing; it is a place." Plan view of the design by Balmori Associates / Cooper, Robertson & Partners. Final designs will be shared in September and the jury will select the finalist in October.